The deadline for ISO 9001:2015 compliance is rapidly approaching. Organizations cannot afford to waste time with redundancy or inefficient full-system gap analyses. This blog provides a model you can use as a "How To" guide to quickly transition to ISO 9001:2015. The key to transitioning efficiently is having senior leaders, process owners, and internal auditors working concurrently as shown in Figure 1. Senior leaders need to define the organization's context, set objectives, understand (and use!) the organization's process for risk mitigation, and be able to provide objective evidence of their commitment. Senior leaders need to scan their environment and define the "issues" that impact the organization. External issues may come from legal, technological, competitive, market, or economic environmental factors. Internal issues may come from the values and culture of the organization. Leadership needs to list those issues relevant to its business (potentially in the quality manual). For each issue identified by leadership, related information to track and review must be determined. The purpose of defining an organization’s issues and monitoring information related to them is to avoid surprises as the environment changes. Whatever information is tracked will be shared during management review (clause 9.3.2(b)) and relevant records retained. Senior leaders need to determine who the organization's "interested parties" are. The list may include customers, end-users, suppliers, employees, owners, and/or regulatory bodies. Each interested party has its own needs and the organization must determine what those needs are (potentially by asking). Again, the organization must track and review information applicable to interested parties and their needs. How do key processes within the quality management system work together? Document the processes in a way that shows their sequence and interaction (clause 4.4.1(b)), such as a flowchart or business process map. Keep this diagram of the organization's quality management system at a high level. Avoid details. Maintain this diagram in the quality manual. any need for improvements to the system. This is the information leaders should keep in mind when reviewing or revising organizational objectives. The activities of the QMS will be working toward achieving the objectives, so they must be the organization's true objectives. Otherwise, the organization is inadvertently allocating resources to achieve goals that are not mission-critical. "Risk-based thinking" is a new term in ISO 9001. The actual term is found in clause 5.1.1(d); it states that top management shall promote risk-based thinking. But the primary clause that addresses risk is clause 6.1. For those risks identified that need action, the organization must assign, take, and evaluate action. 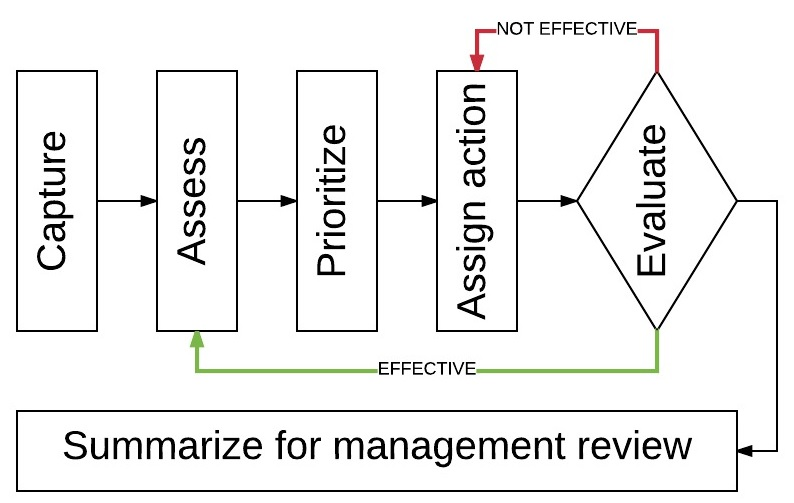 The core steps in a risk-mitigation process are shown in Figure 2. Actions taken to address risk must be summarized for management review (clause 9.3.2(e)). The last step for senior leadership is to ensure they meet the leadership requirements of ISO 9001. First, verify the quality policy: Is it appropriate for the organization's purpose and context? Does it support the organization's strategy and objectives? Does it show commitment to meeting requirements and continual improvement? Is it communicated? Senior leaders must update and communicate, as necessary. UNDERSTAND YOUR PROCESSES (Clause 4.4.1a, c, d, e, f, g, h) – Note that in this model clause 4.4.1(b) is addressed by leadership. h) determines how the process is improved. These aspects of the organization’s key process should be documented in a table (where each row is a process and each column represents one of the aspects listed above) or something like a turtle diagram (you may find turtles don’t have enough legs to capture each element of the process). 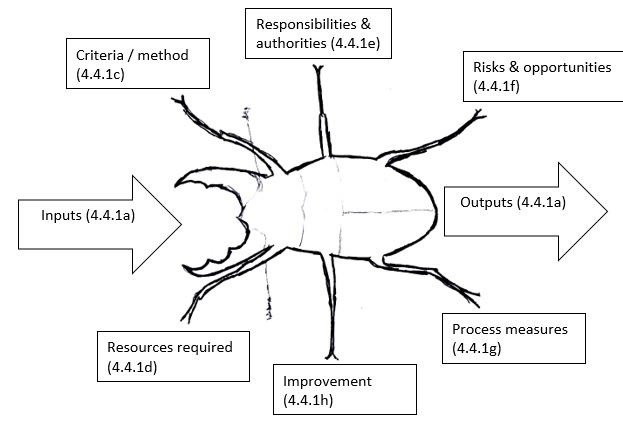 Another option is the beetle diagram shown in Figure 3.